The Christmas decorations come down, and everything looks so stark and plain, but it doesn’t have to be that way! Try some of these ideas to brighten up your home during the long winter days. Change your light bulbs to those that give off a blue hue to mimic sunlight. For dark mornings, invest in a sunrise light that comes on and brightens over a period of time to simulate the sun rising. Force the flower bulbs you were given as gifts. Their bright colors will bring Springtime early—indoors, anyway. Use light, bright colors everywhere you can—cozy throws, pillows, slipcovers, and accent rug—the light colors reflect what natural light we have coming through the windows and help boost our mood. Using natural items isn’t just for Christmas. A basket of pine cones with battery operated LED lights woven through them, or a simple wreath of twigs can double as decor for January. Use snowflakes, no matter where you live, to brighten up your interior. Get the kids to cut out paper snowflakes, or make these popsicle stick snowflakes. Hang either on clear monofilament and make a mobile or garland and hang them in a window. 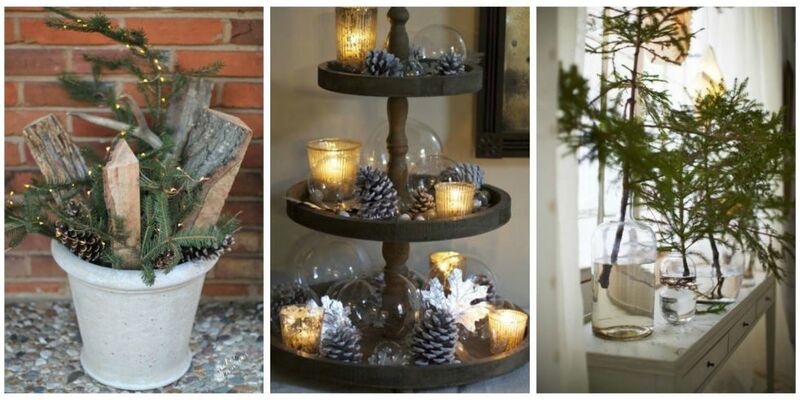 Cut the arms off of old sweaters and use them to wrap around candle holders and vases for a fun, cozy appearance. Clip small branches and twigs, spray them with white spray paint, (or leave them natural), and display them in vases with artificial snow, small pine cones, or whole nuts as a filler. Hang a mirror, or several, in a dark spot in your home. It will reflect light and brighten the space. Winter greens joined with a child’s sled, vintage ice skates, or a harness of jingle bells make great front door adornment. Use unused scarves wrapped around a foam wreath core for a fun and unique decoration. Hang a pair of mittens in place of a bow. Do you or any friends have flowering trees? If so, ask them for a few snipped branches, and force-bloom them with these tips from Fine Gardening. The Springtime buds will brighten any room. Decorating for the colder months doesn’t have to scream Santa. Light colors, natural things and cozy pieces are perfect for brightening the long nights, and making your home as inviting as it was during the holidays. How To Make Your Living Spaces Appear Larger! Use mirrors to fool the eye, because they reflect light and images. Hang one larger mirror on the main wall, several small ones, (gallery style), or even an oversized mirror leaned against the wall. Painting walls a light color automatically opens up the space to the eye, because it reflects light. Going all one color is a great way to make the room appear larger, too. Get rid of clutter. The more you have sitting around–mail, books, work, kids’ school things–the fuller your space looks. Baskets, files or paper organizing gadgets, decorative storage containers, or furniture pieces that double as storage are the best way to hide necessary things. Get rid of, (in other words, throw away or recycle), junk mail and unnecessary paper as soon as you look at it. Draw an imaginary diagonal line across your room and place your furniture at an angle. You even get a bonus storage area behind anything that covers a corner! Pieces that are the same color as the walls blend in, making the room appear larger. Either skip window coverings, or use sheer drapery or curtains and blinds that are the same color as your walls. If you have to use drapes, hang them either at ceiling height, or just inside the window so the framework is visible. If you want bookshelves, consider a wall-to-wall, floor-to-ceiling unit. Draw the eyes horizontally and vertically. Speaking of bookshelves, the less you have on these open spaces, the roomier it looks. Cramming every collection, book, or “trinket” just fills up the space in a similar way that clutter does. If you must display sentimental pieces, display a few at the time. Switching them out on occasion will also give new appreciation for them. 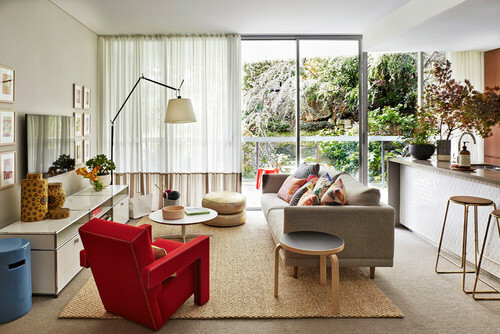 Choose sofas and chairs with exposed legs to allow to light to pass through underneath them. The more light in your room, the better. On that note, light is your friend. If you can’t get more natural light into the space, use a few lamps instead of an overhead light, as it draws the eye to look around the room. Keep patterns small. Use a punch or two of larger patterns on pillows or throws, but not too many–remember–less is more. If you need an area rug, don’t settle for a small rug under the coffee table. Purchase a rug that extends out from the furniture, as it will draw the eye out. Create a focal point with framed pieces on one wall, especially behind a sofa, and extend the arrangement to the ceiling, and it will make the space appear taller. It will also add pop and take away from the room’s size. Drop-leaf tables or dining tables with the extra leaf removed work best in small areas, and if you need more tabletop space for guests or for workspace, simply add the leaf. Small spaces can still mean big living–we just have to make a few adjustments to maximize the space and create a few illusions for our minds to think big. Better Homes and Gardens has multiple ideas for small spaces, from apartments to living areas, as well as those awkward spaces.